At Beyond-X we offer several different Bibs ranging from Alpine racing, Ski-X & Snowboard to Crew & Workplace Bibs to our newest additions the Multisport Bibs. 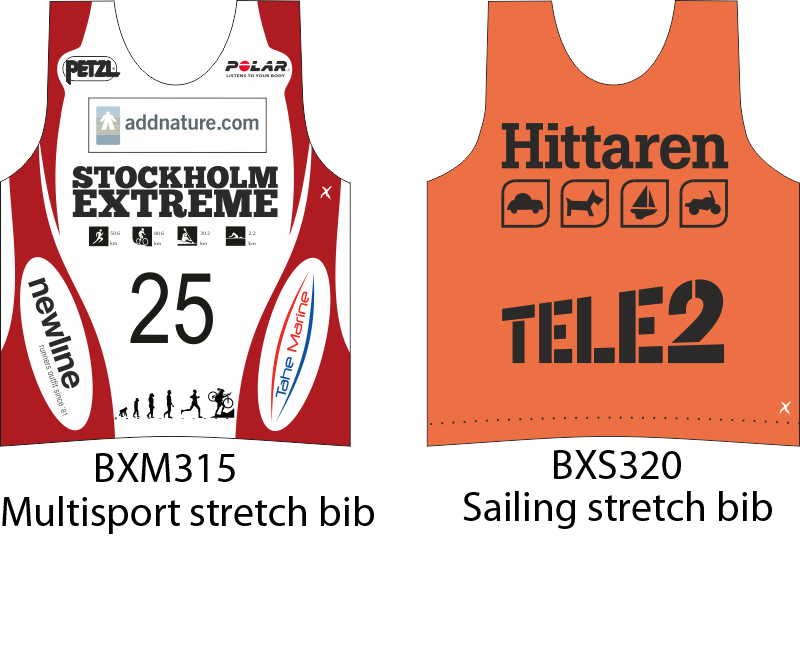 Race bibs of various types, has become a specialty of our factory. With both sewing as well as screen and digital printing in-house, almost anything is possible. We have been an active part in changing the world from white bibs with a sponsor logo and digits, to all full out designed race bibs. The athletes wearing our bibs are fast, and so are we. We offer Bibs with superb quality, high flexibility and elastics. Race Bibs can be used in many different ways. 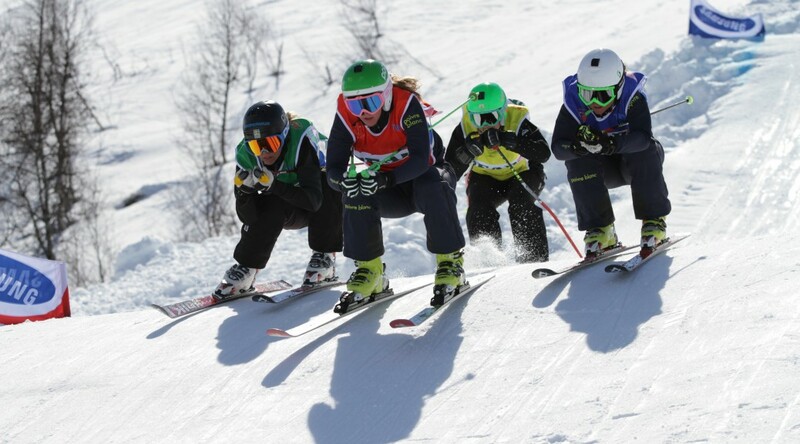 Some larger ski clubs need bibs to keep track of their young athletes during training sessions. In the above example they have used their race suit print design in a number of coloration alternatives to separate one group from another. Are available in 5 different sizes including FIS size Men’s size BXA300 and Ladies’ size BXA301 race bibs, Kid’s size BXA302, a larger Multi-sport size BXM315 and the largest Sailing size BXS320 race bibs. They are all produced in high quality very elastic 4-way stretch fabric. Digital printing process allows virtually unlimited numbers of colors and no order minimums. Men’s size BXA300 alpine stretch bibs are also immensely popular as kids ski school vests. Helping the ski instructors to keep track of their group. 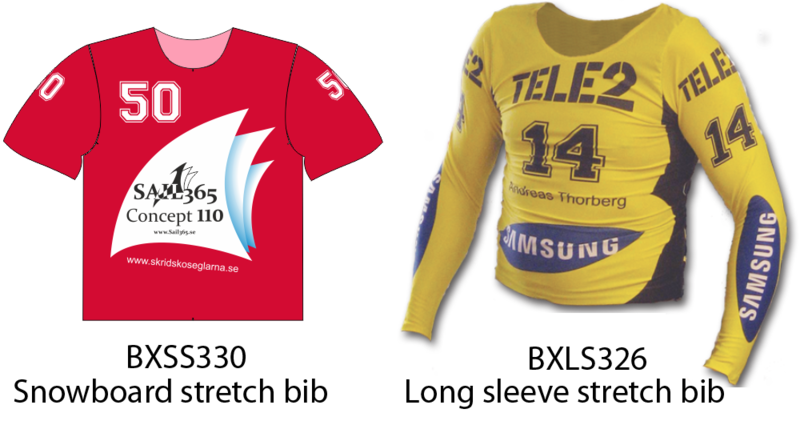 Cool designs and bright colors increases the ski school attractions and the professional look. For the older and adult students, who often reject using a vest. Then our BXAB480 stretch arm band can be a better solution. Our type of race bibs are now spilling over in to a number of other sports. 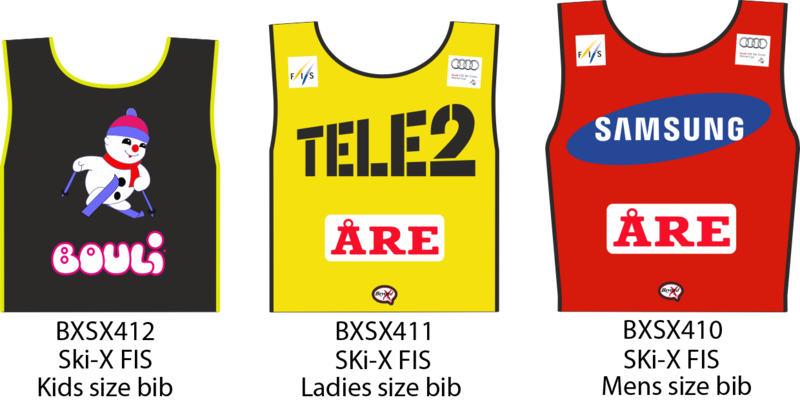 We have even developed the BXLS326 long sleeve race bib for special requirements. Some of the sports we make custom bibs for is canoe, fencing, horseback riding, sailing, ski-orientation, skiing, water skiing, water scooting, x-country. Made to FIS specifications for WC-Events. Available in FIS men’s sizes BXSX410, BXSX420 and ladies’ sizes BXSX411, BXR109 as well as kid’s sizes BXSX412, BXSX420 and BXSX423(XS). Our most popular Ski-X & Snowboard BXSS330 race bibs. 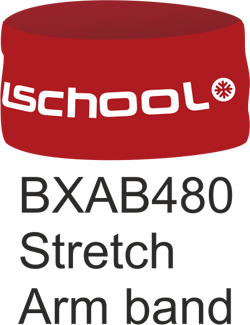 Commonly used for Ski-School classes and therefore also offered in an extra small kids size. Other popular use is for race crew where the digital printing process allows many alternative prints with no minimum order requirements. Greatly enhances the professional appeal of any event. They make it easier to see who is doing what within the administration. And they present an additional opportunity to sell in a sponsor. We offer a special Stewards Bib available in two sizes BXS452(L) and BXS451(XL) or the BXSX420 SkiX Bib for this purpose. Of course one of our main services is to help you with the design of the bibs, as well as with what type of bibs we would recommend, which varies from digital to screen pressed. While we make custom printed designs, we make sure to have bibs already sewn, ready to go for your custom prints so we are able to send the shipment as fast as possible. We also offer complement possibilities to keep a complete selection of bibs available in case a fast order of new ones would be needed. 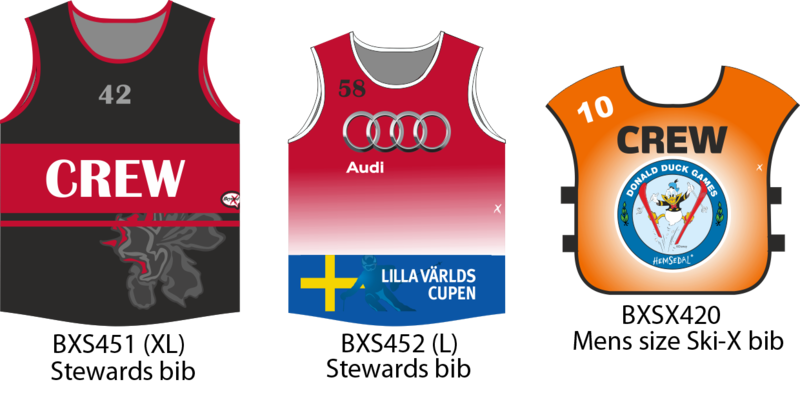 When it comes to alpine events and the bibs we have made after requests from our clients, our portfolio ranges from SkiFuntastic, Guldhjälmen, Åre Highfive, USM, JSM, SM, Freestyle SM, Cross Country Skiing JSM, Cross Country Skiing USM, Ski orientation WC, Donald Duck, Multisport Cuppen, Svenska Landslaget Alpint, Svenska Snowboard Landslaget and Cross Country Skiing team.